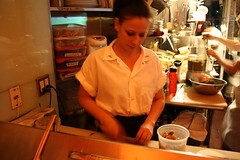 Helen Zhang Amanda Cohen at work in the kitchen of Dirt Candy. Ms. Cohen ascended to food blog notoriety over the past year, thanks to her recent appearance on the Food Network’s “Iron Chef America,” dueling Masaharu Morimoto in a battle of broccoli. Since then she’s claimed her own hash tag on Eater.com, turned down the chance to be on The Next Iron Chef and gained a few admirers expressing their affection via Craigslist. She draws 7,000 visitors on the restaurant’s blog each month. We caught up with Ms. Cohen earlier this month as she briskly chopped dozens of stalks of celery in preparation New York City Wine and Food Festival. There are dozens of dining options for vegetarians in the East Village. How is Dirt Candy different from a typical vegetarian restaurant? There are fish restaurants in the city, and steak restaurants, and you know, fried chicken restaurants, and we revolve around vegetables and there is nothing like us in the city. So we happen to be vegetarian, but that’s not our focus. Our focus is vegetables.